Lust - There's a reason why mushroomers so often refer to their prize in terms of romance and sexual imagery. When the summer monsoons come, chiming the opening bell of porcini season, I start to burn with desire. But just one look at a B. rubriceps of the Rockies, with its wine-colored cap, creamy pores, and finely netted stalk, and you will understand the lure of its physical beauty. And just one whiff of a porcini - smelling like a mashup of baby skin, loam, and rain on pavement - is all you need to know what it means to be a creature of this earth, a fleshy lust-filled mortal, born of dirt and returning in the end. Greed - You know, I try to be a good person; I do. I smile, I say kind things, I try to lend a hand. But when it comes to mushrooms, I won't lie, I'm greedy. Not only do I want a few porcini to nibble, I want them all. I'll tell you that I'm over the moon just to be in the woods. I'll say it's my goal to collect enough for a few good meals. Don't believe a word of it, friends. I want every darned porcini that I can get my hands on, so that I can continue to stuff them down my pie hole, one after another, all winter long. And I'm not above using devious tactics either. I've gone to great lengths to teach my family, friends, and neighbors how to spot B. rubriceps, and to report back to me if they should come across any. But I'm always certain to taint these lessons with warnings about how eating wild mushrooms does come with the risk or illness and even death, so they don't dare to take any for themselves. Sloth - Ok, so my house is always a bit of a pit. But lately, it's become a real craphole. This is in part due to the fact that I like to spend my free time lounging under a tree, fancying myself the Rockies' answer to Rene Redzepi, creating whimsical mushroom recipes beautiful enough to be museum pieces. No seriously, I could sooo do that. I'm the creative type, after all. Which, by the way, is my usual excuse for messiness. But add porcini obsession into the mix, and dishes and dust seem to fade into the background. Don't worry, though, I do clean the toilet regularly, so it's still safe to visit, k? Wrath - And don't think I possess simple jealousy when it comes to this 70 lb mushroom snatching freak. Oh no. I want to hunt him down, tape him to a chair, drop some water onto his forehead in a effort to make him tell me where to find that poricni patch, and then make away with his mushrooms. Wa-ha, take that you stinking mushroom hog! I win, sucka! And sadly, this little fantasy isn't my only brush with wrath. It seems that I may have warned more than one mushrooming companion with physical violence should they bag more than me. But I plead the fifth. Maybe it was someone else who threatened to konk Erica over the head, or brawl with Julia in the forest. Pride - I'm pretty sure that I'm the best porcini hunter to ever tread the forest floors, just saying. Who else can spot a porcini knuckling out of the ground from a speeding car? Who else has an uncanny ability to sense the very vibrations of B. rubriceps emerging? Oh yeah, that's me (cue the super power music) Mushroom Woman! Gluttony - Porcini mushrooms are prized the world over for their superior flesh and flavor. Now that I've had the Rocky Mountains' finest, I'm forever ruined for simple grocery store buttons. 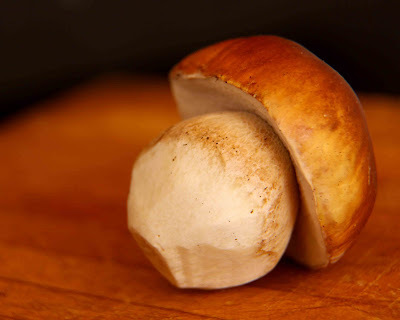 The flavor of wild porcini is buttery and full, tasting of chestnuts, ham, and wood. 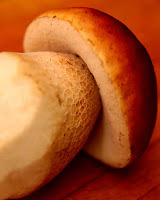 Porcini are so delicious that I want to eat them breakfast, lunch, dinner, on a boat, on a train, and in the rain! I want to eat them served over pasta, on pizza, in eggs, and with steak. I want to cozy up to a bowl of deer stew enriched with dried B. rubriceps. 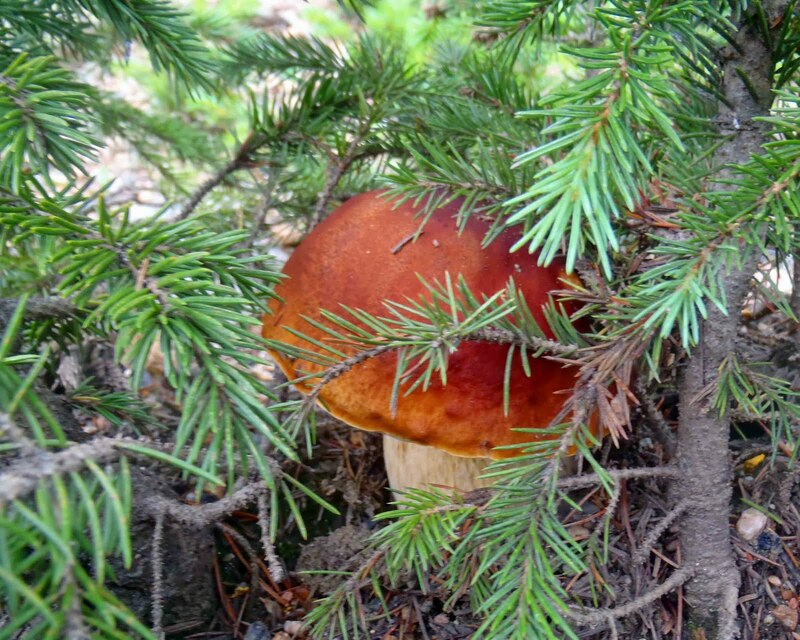 I want to experiment with porcini powder, and oil, and even infused-alcohol. 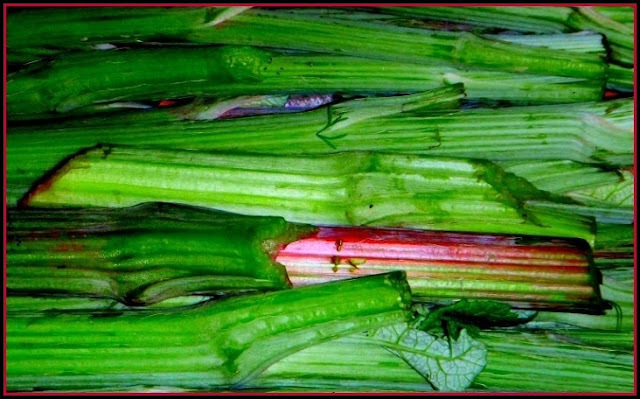 And most of all, I want to eat those delicious gems, sauteed in gallons of butter, with a smidge of feral garlic and bee balm. Sigh, here I was supposed to dissuade you from falling for porcini, to spare you the the possibility of committing these same deadly sins. But I can't do it, because the taste of freshly foraged wild porcini mushrooms is positively bewitching, and well worth risking eternal damnation. So, if you get the chance, hook up with an experienced mushroom hunter or your local mycological society, and forage some Boletus edulis for yourself. *Ok, you got me. That was just another attempt to have all the mushrooms to myself. I'm sharing this one with Real Food Wednesday, and Pennywise Platter Thursday. BEST POST EVER! I don't usually come out of the woodwork to comment, but this was hilarious and awesome...makes me want to find some wild porcini of my own...or maybe it's scaring me off...which was probably your intent all along so you could have them all to yourself! :) Great post! Absolutely loved this post, you little heathen! I needed a laugh this evening; thank you for sharing this post with the Hearth and Soul Hop. Happy hunting, I hope you exceed your wilest dreams! Butter I think your writing skills have far exceeded your love of mushrooms! I've never tried wild porcini's but I do LOVE Morels. 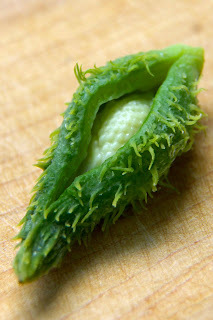 Great post and thanks for sharinga at the hearth and soul hop. Oh my God, I just read this now and hahahahahahaha. BTW: Are the photos in the post yours? I like their quality. Any tips how to make good photos of mushrooms? 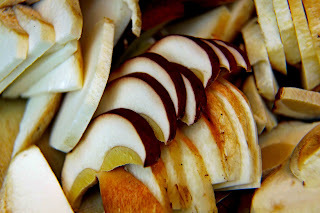 Yes, they're my pics :) The picture of the sliced mushrooms isn't composed, I just noticed they looked pretty when I was preparing them. The other pics were taken in my pantry, which has nice soft lighting. I try to concentrate attention on one feature of the mushroom. In the top picture, that was the shape of it, the echo of roundness in cap and stalk. In the last picture, I wanted to show the netting on the stalk. And what lightening did you have for sliced mushrooms? Just day light or some additional lights? I have yet to forage mushrooms in earnest. I have spotted some chanterelles but no great big clusters of them and I only see them when they're too far gone. However- I get greedy with whatever I'm foraging. I want ALL the elderberries in my county. Whatever I'm picking I want more and more and more. Right now I have blackberry greed. I know that compared to hunting mushrooms picking blackberries is an activity that requires zero hunting skills. No matter. It still triggers my need to gather them all. I've got 12 jars of blackberry jam already. I don't need more but I feel that I should have more. And nettles... no such thing as too many. I have many quarts of dried nettles in my pantry. Someday I will be hunting mushrooms but you have to admit that it's hard to find people willing to show you the way because all mushroom hunters feel the same way you do. It's a super secret activity. I'll muscle through eventually. LOL!!! We 'road hunt' boletes as well! Spotting a mush hump at 30 mph is a skill, no doubt. Angelina - Don't let anyone fool you. Mushroom hunting is 10% skill, 90% luck. And I've taken a lot of novices out with me this year. I never take them to any of my sweet spots. Instead, I taken them to an entirely new location, one neither of us has seen. I figure that's fair game. OMG you are so funny, and I apparently have some catching up to do on your site. Love the deadly sins! The jealousy bit in particular struck a chord, because after our early season bolete hunt (in which I appreciate your restraint in deciding not to knock me over the head) I came home insane with desire to find them, and then experienced some jealousy and depression when my initial solo ventures were unsuccessful. It's puffball season like crazy up here suddenly, so there's always consolation in other kinds of mushrooms, as you mention in the "non-choice" entry. Is it time? Is it time? I'm ready to go! I loved this post! I stumbled across a mammoth swath of porcini in a fir forest, and completely ran out of receptacles with which to carry all of the bounty out. I had to leave some behind. Not a good moment, despite the fact that I was staggering under a fair amount of the beauties already. I totally get you!